a degree of political instability. On the plus side, unlike in previous EME crises, most had built up significant foreign exchange reserves and had improved governance and accountability. Fast-forward nearly two years and what has happened? The Fragile Five didn’t fall into a financial crisis. Indeed, the taper tantrum came and went, and global financing conditions actually got easier again. Having been given a bit of a taste of what might happen in the event of higher rates in the US in mid-2013, the vulnerable EMEs got a break and were given the chance to get their houses in order. So presumably there is much less to worry about now, right? Wrong. The good news is that India and Indonesia (both under new governments) have pursued a range of policies, both cyclical and structural, to move towards a more sustainable outlook. A number of the key vulnerabilities have eased (particularly relating to external weaknesses) and the market has rewarded them accordingly. I could write entire posts on each of these and how far along they have actually got, but I would rather focus on Brazil, Turkey and South Africa – the Troubled Three. The IMF’s April Global Financial Stability Report has a number of key metrics for assessing sovereign/financial vulnerabilities. 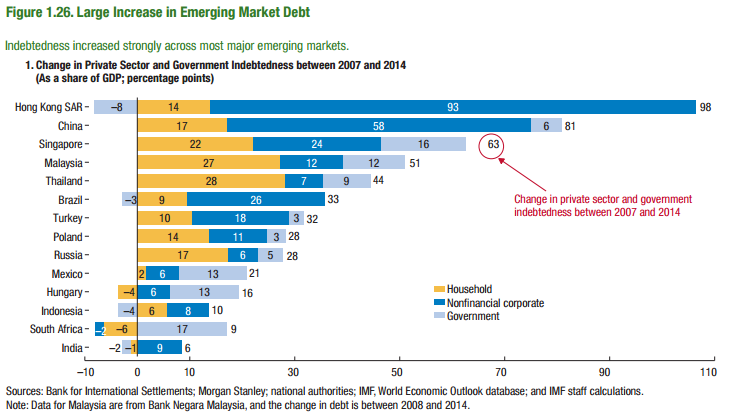 The first chart below shows the rapid pace of credit expansion across EMEs since 2007. 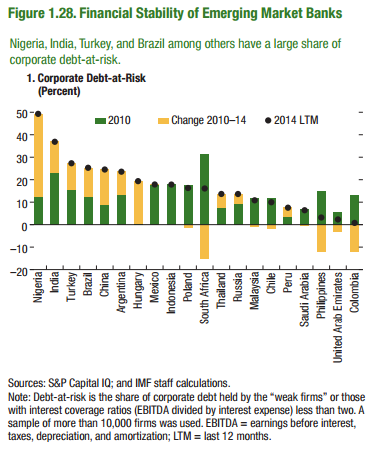 Brazil and Turkey rank behind just China in the increase in non-financial corporate debt. While South Africa has seen the biggest increase in public sector debt. The Troubled Three have also seen an increase in foreign currency debt held by households and firms, with Turkey notably rising to nearly 30% of GDP. 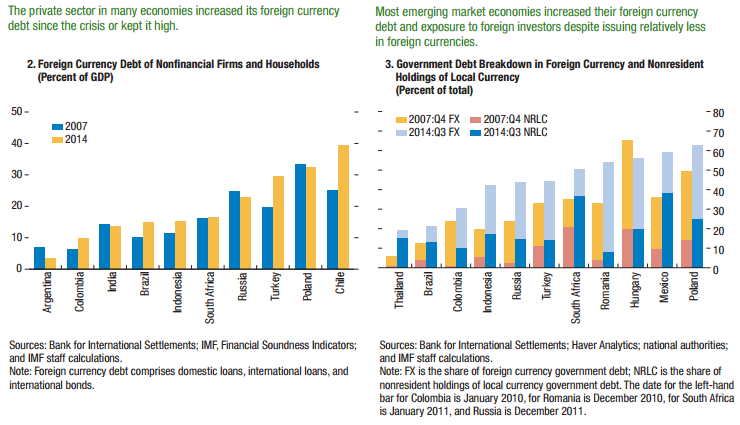 Foreign currency govt debt also rose significantly in Turkey, while foreign nonresident holdings of local currency debt rose materially in both South Africa and Brazil (making them more vulnerable to a sovereign debt run). In terms of broader external vulnerabilities, all three continue to have large current account deficits: Brazil over 4% of GDP and Turkey and SA over 5%. As a comparison, India’s CAD has fallen to 1.5% and Indonesia’s is under 3%. One area where Brazil does do well is foreign exchange reserves, which are around double the short-term financing requirement (defined as short-term debt maturities plus current account). However, South Africa is just 0.9% and Turkey props up the EME complex with coverage of just 0.6%. Turkey and Brazil also ranked poorly on a measure of domestic bank risk, via exposure to weak firms. One area of difference amongst the Troubled Three is exposure to the commodity cycle slow-down. Around 50% of Brazilian exports are commodities (o/w around 7pp is oil). South Africa’s exposure to weaker commodity prices is also sizeable at around one-third of exports. However, Turkey is primarily a commodity importer, with commodity exports accounting for just 13% of the total. Finally, the macroeconomy in the Troubled Three has deteriorated over the two years. In Brazil, inflation has been persistently high, with the IMF expecting it to be 8% in 2015. That is despite the central bank of Brazil raising rates to over 14% (as the state subsidises lending to businesses, the effective rate is likely much lower, at the cost of a worsening fiscal position). At the same time the economy is expected to contract by 1% in 2015. Alongside the external and fiscal concerns, not to mention the very challenging domestic politics and corruption scandals, Brazil looks to be in danger of spiraling down into a severe crisis. In Turkey, inflation has also been persistently high, with the IMF expecting 7% in 2015. The Turkish central bank have been much less aggressive at hiking rates, with policy rate currently at 7.5%. While the decline in growth has not been as dramatic as in Brazil, it is currently running around 2.5%, much slower than in previous years. However, Turkey arguably has the most worrying domestic political situation. Despite President Erdogan failing to get the majority he needed in the last elections to turn his office into an executive one, he still wields tremendous power, and is highly unpredictable. The recent military attacks on the PKK do not bode well for stability there. Finally, South Africa has done somewhat better in keeping inflation under control, although it remains above target at over 4.5%. Similarly the slowdown in growth has been less dramatic, with GDP currently running at around 2%, down from around 3% immediately post-GFC. It is often said that it is only once a country is in crisis that there is the will to undertake reforms. Of the Troubled Three, Brazil and Turkey may be getting very close to a crisis situation. Chinese growth is slowing and the Fed are likely to raise rates fairly soon. These could be the final straw for Brazil and Turkey, with the only way out a large depreciation of the currency. South Africa is slightly better-placed, but needs to undertake a range of reforms to avoid the downward spiral. 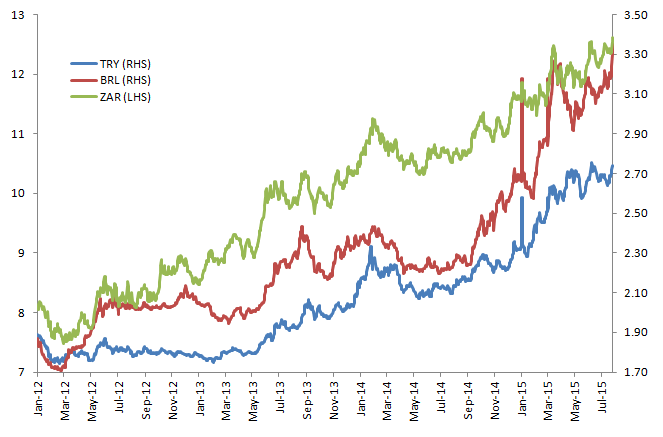 Since the start of the year the BRL, TRY and ZAR have all depreciated by around 6% against the dollar. While the declines since the post-taper tantrum peak are around 30%, 50% and 20% respectively. A fair amount of those declines are a dollar strength story, with the nominal effective exchange rates down only 10%, 20% and 5% respectively. But with significant corporate foreign ($) debt exposure, one does need to consider the impact of both. In terms of the real effective exchange rate, the BRL is still around 70% (!) higher than the low-point in 2002. It was the election of President Lula that turned things around in Brazil in 2002 (the opposite to market expectations), but the recent re-election of President Dilma, despite a promising start, has quickly seen sentiment turn sour again. The TRY real effective rate is around 30% above than the lows of 2001, but as I have outlined above, faces its own problems of political instability. Finally, the ZAR real effective rate is around 20% above the lows of 2000. In other words, all the currencies have the scope to fall much further. If the governments do not get a grip, I expect the next 6-12 months could see further significant declines, with likely higher interest rates and weaker growth. As a trade, the momentum is already working in favour of going short these currencies. But the negative carry is material (indeed, in the case of BRL it would have left you flat YTD). And the risk of a sharp policy shift cannot be ruled out. So it might be a case of moving fast to increase sizing after an acceleration in the trend is seen (eg that might be after a Fed hike in September).